Traveling through Europe in the cooler months, you can still come across street vendors selling small bags of chestnuts that were, indeed, roasted on an open fire (usually charcoal) and the last time I asked, at the foot of the Spanish steps, they were close to a Euro for a couple of large nuts! These chestnuts had been scored with an X on the shell so that once they were cooked, it would be very easy to peel them open to savor right there on the street. 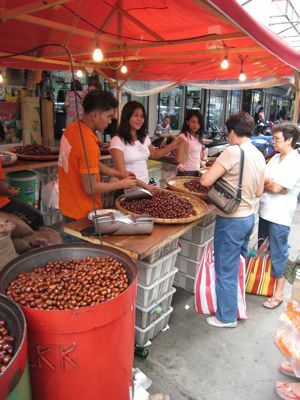 In Manila, one of the best harbingers of the holiday season are carts offering roasted chestnuts and the cooking process used here gives off a very distinctive aroma. I think the Asian chestnuts are tastier and sweeter. Beats the big ones anytime. It definitely isn’t Christmas without chestnuts. I remember when they were not as readily available during my childhood. Lucky everyone these days, then can be found practically whole year round. 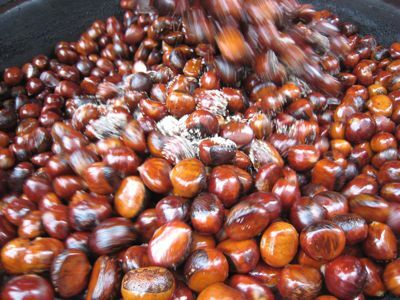 Nothing like freshly roasted castaÃ±as………..
Haay, love chestnuts- roasted, as marron glacÃ©, spread, cream, basta chestnuts. I love the whole process of cracking, peeling then eating them. Just as they roast peanuts with sand, I suppose the ball bearings help to bring the temperature gradually to the desired heat then keep it constant so as not to dry or shrink the nuts. Here in the US I X them before tossing in the oven or I get a chestnut explosion. For a quick chestnut fix, they come vacuum packed in aluminum packets, the Asian variety that is. I see these in Manila as well. But of course, nothing like getting them fresh off the roasting pan as Celina says. Hubby loves them.So good when they’re nice and hot. Just a funny note: Stand beside those roasting carts even just for a second and soon,when you get into your car,you”ll smell like a roasted chestnut–hair and all–hahaha you’ll really need to take a bath as soon as you reach home. It doesnt matter if you’re in Divisoria or greenhills or anywhere..you’ll smell like a chestnut….Teeheeee..
am too impatient to peel, so am happy to find fresh peeled, bottled chestnuts at monoprix in paris during season. even brought some to MLA with me. but yes, not as tasty as china chestnuts. Hehe, yes, they sometimes taste like camote. But I am an addict nonetheless. I always go to Quiapo/Divisoria around November and REALLY scout for vendors who are cooking the chestnuts right there. I have already been there twice last month and got them for 170/175 pesos a kilo which I thought was a great bargain as the going rate for stalls near supermarkets are 200/kilo. I get the smaller ones which they call mandarin as I find them tastier. I guesstimate that I have consumed 1.5-2 kilos of chestnuts already and have decided not to buy anymore (for now). Addicting, you say? I seriously need rehab. Would you like a chestnut roaster- I have an extra one- to go along with your fish pan… what else can we mention to piss off some folks? When I go into the big kitchen in the sky whoever is left behind can hold the yard sale of all time. The chestnuts from Italy are good for chestnut flour, a staple baking ingredient in Europe. Sounds like the chinese chestnuts are cheap and delicious, we are paying $6. a lb. for raw Italian chestnuts. i need my fix soon! the only chestnuts i’ve had so far (as of this year) were some lovely ones soaked in liquor, i forget which one. there were about four bottles of the stuff and all but one are gone! About a month ago, we had balikbayan guests and I bought them a kilo for PHP 180. It must be more expensive now because of the season. They were also interested about the contraption that the sellers use because a friend has a chestnut farm. Could it be improvised? Oh, I love roasted chestnuts…never failed to get them whenever I see them being freshly roasted anywhere…Manila, HK , NY chinatown…but I thought that they use black pebbles…I didn’t know they use steel bearings…I guess I need new glasses, huh? 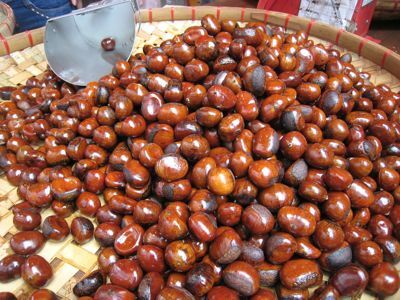 I love roasted chestnuts whether European or Chinese origin. My parents loved roasted chestnuts and I never developed a liking for them. I think they taste like camote. One time, I saw boxes of the raw nuts at a neighbourhood greengrocer at such a cheap price that I bought half a kilo just to find out if I would change my mind about them. I researched about how to cook them and one reference suggested baking them in the oven. I made slits in the skin as instructed and put the nuts in the oven. Sure enough, despite the slits, the darned things exploded, coating my oven with fluff. It took me a good part of the day to clean the oven but I must say the aroma and the taste of the oven scrapings were worth it! Nina, if you ever have to do it again, boil the chestnuts for a few minutes after you have X’d them then put them in the oven to finish cooking. By doing this you will avoid the explosion.I put a little bit of vegetable oil in the pan so as not to dry it; also gives the shell an appetizing shine similar to the ones in MM’s picture in the roasting kawa. my parents have passed on their love for chestnuts to us and even to their grandchildren. one of my favorite christmas rituals is of playing board games and eating chestnuts, with christmas music in the background, while waiting for 12 o’clock on christmas eve. My husband and in-laws adore chestnuts. Not mad about chestnuts but Iâ€™ll eat them. I agree it taste like camote. I crave for fried peanuts with garlic and salt. yep… speaking of exploding chestnuts… those people selling/cooking chestnut over at salcedo market should be more careful and if i may suggest take extra cautious. Me and my son are on our way out of the park one saturday noon when i piece of nut hit me.. i just laugh if off but again they should be more careful about it. Hahaha! Kamoteng sosyal as we call chestnuts at home. Funny thing was when watching one of Keith Floyd’s shows when he was in Indonesia (I think) he tasted a roasted kamote and declared that it tasted just like chestnuts. I received a sackful of uncooked chestnuts a couple of months ago. Didn’t know what to do with it haha so I gave it to a friend who had the time to experiment with them. While plain chestnuts are not really something I crave (as me and my brother call the roasted ones expensive camote! ), I tasted a marron icecream and a marron flavored yoghurt here in Seoul, and they were so yummy! I think chestnut works with a creamy, milky base. My recent fixation is a seasonal marron/chestnut flavored doughnut from Donut Plant–it evokes the spirit of the holidays– sweet, snowy, and fleeting. anna banana- next time you have raw chestnuts try this: It’s very easy to roast them. Take a sharp small knife and make a 1 ” slit on the skin only- place the chestnut on a board , hold with thumb and forefinger, place on a cookie sheet or half sheet with 1″ sides. Sprinkle with a little water only. Place on the floor of the 400 F preheated oven for 10-12 min. When they gape open they are done. If you do not slit them they will explode violently and the mess will be unbelievable. 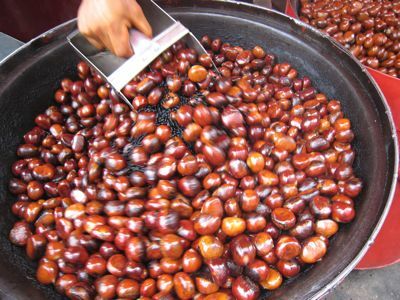 Chinese chestnuts do not have to be slit because they are looser inside the shell and have room to expand. There are curved chestnut knives available, to go with the fishpan, grape scissors, chestnut pan, etc. I’ve adored chestnuts all my life! I often roast halved brussels sprouts together with chestnuts as a side dish to roast duck or goose (or simply to devour on their own). I love marrons glaces! And chestnut pies! I have occasionally had Japanese sweets incorporating chestnuts–I especially love the little pastry-enclosed mochi sweets that have a whole chestnut in the centre! A friend of mine who is even more of a chestnut addict than I am has a gadget that had a spring-loaded x-shaped blade that punches an X into the shell. I tried it and it certainly was easier than using a knife. My late dad loved chestnuts. We used to laugh at him because of this habit of his to shake each nut he picks up. If the nut inside the shell shakes, that’s the ones he picks up. When asked why he would say that it would be easier to peel and he was sure that once opened, he would get a whole nut out of the shell. Now that he is gone, we honor him in this way now whenever Christmas season rolls around. Thanks, sister for the tip! Will do that when I get another free sack of chestnuts haha! I saw some ajimas (older women) in the subway selling these chestnut openers a few days back. Kinda interesting how easy it looks. They were opening uncooked castanas so fast while chatting with each other! Kinda interesting how easy it was to use. Almost got tempted to buy one! Off-topic: Hey erbie. I have no idea who you are, haha. Anyhoo Enjoy the holidays people! Will go home to Pinas tomorrow for my first tropical christmas in years. Can’t wait! Lots of elderly women selling chestnuts(roasted on charcoals) and boiled corn in the subway stations here in Seoul. I have never liked chestnuts(since to me they taste like camote and camote is not one of the things I like to put in my mouth) but I took a chance with these last week at Gangbeon and they tasted better than the ones in Manila. Or maybe it was just the novelty. pls post a recipe over kastanyas..
Well, I heard that this nut tastes better but I haven’t taste this yet ‘coz it’s very dare but I have a plant and dont’ know how to cook this kind of nut, so please kindly give me that idea on how to cook it.